Let this mother duck and her ducklings waddle into your home, and your heart. Completely hand-carved from recycled bamboo root and teakwood, these adorable ducks sport bright yellow rain gear, inquisitive eyes, and delightful webbed feet. Shelter the mother duck, little duck, or baby duck, or collect the whole paddle! For indoors or out—after all, they do have raincoats! Handmade in Indonesia. Adult: 5" W x 8" D x 18" H; 3 lbs. Teen: 4" W x 5" D x 14" H; 2 lbs. Baby: 3" W x 5" D x 8" H; 1 lb. Care: Can be used for indoor or outdoor use year round. Dust off and wipe with a furniture cleaner. Due to the handmade nature of this item variance in height, wood grain, coloring and direction of head is to be expected. I am so happy to have this little family to make part of mine. They wilil be well taken care of! Wife coveted for a long time. She has hard time buying for herself. Turns out that our daughter who was visiting from California and I got same idea and unbeknownst to each of us, we both ordered Mom a duck. Now we all are smiling every time we see the ducks and our granddaughters who are both three want one as seen on FaceTime. Purchased for use in outdoor garden. I don't think they would do well outdoors. Only one had boots but don't think the boots would work outdoors anyway. It cost $25.00 to return them. Did not like that so will really think long and hard before purchasing again. I purchased all three ducks. They look oh, so cute, "walking" together in our garden outside our patio. Everyone that sees them comments on them! Always happy with items purchased at Uncommon Goods. This trio was exceptionally charming . Intended as a gift for my hard to shop for adult son but the entire family fell in love with them. 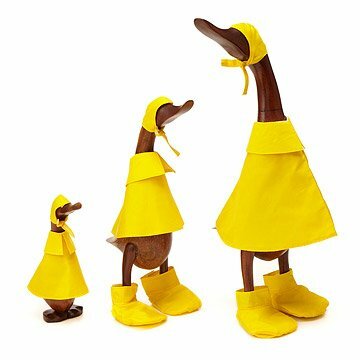 Completely hand-carved from recycled bamboo root and teakwood, these adorable ducks sport bright yellow rain gear.